As the first artist-run center in Regina, Neutral Ground was founded in 1982 as an alternative to institutional galleries in order to offer contemporary and non-traditional art forms, such as performance art, video, and installations. The catalyst was the arrival of artist Nida Home Doherty, who was familiar with the artist-run centres found in other cities. Doherty contacted Roger Lee, a Professor of Art History at the University of Regina. Their work led to the April 29th, 1982, incorporation of Neutral Ground - so named as a mark of its neutrality in regards to factions within the arts community. 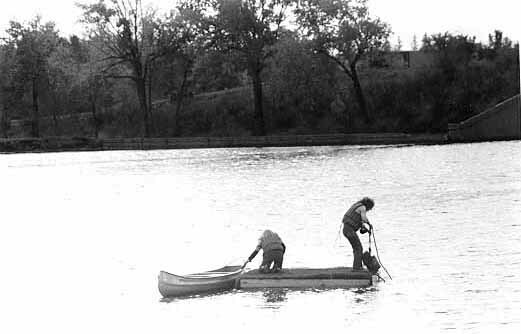 On September 26th, 1982, by launching a sod laden 8 ft. square raft and anchoring it in the center for a week, the gallery was launched both figuratively and literally on Wascana Lake. During this time local artists took turns placing and performing works on the raft, such as Joan McNeil and Pam Bjornson who dressed in black and white respectively, in order to play a game of chess. Artist Christa Donaldson placed a giant frame on the raft, so that spectators could frame scenic views of the lakeshore. In 1983, Neutral Ground was accepted as a member of the Association of National Non- profit Artists' Centres and received funding from the Canada Council a year later. Initially run out of Nida Home Doherty's residence and various other temporary locations, the gallery now has a permanent home at 203-1856 Scarth Street. Controlled by a Board of Directors, the majority of whom are artists themselves, the centre is run by an administrator and gallery assistant.